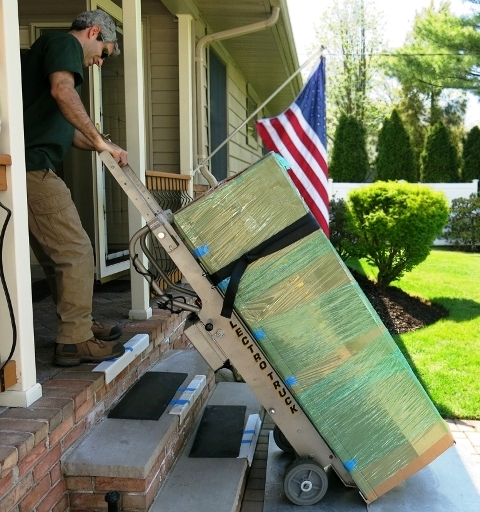 As part of Oz Moving & Storage’s “Moving Tough Stuff" blog series, we talked to Dov of Precision Lock & Safe in Floral Park, NY (Long Island) on how to move a regular safe or a gun safe. Dov and his brother Elaad have been working with safes for 8 years in several different capacities. At Precision Lock & Safe, they’ve completed many jobs in both commercial and residential capacities, and moved a variety of safes. Dov says they’ve moved safes “From 200 pounds to several thousand pounds, high-end to basic, for small businesses and large companies.” He and his brother Elaad at Precision Safe have earned tons of plaudits and acclaim for their work, especially on Google Local. As professionals in the industry, they’ve learned a few ins and outs, and where movers need to be extra careful. Here are Dov’s tips for how to move safes; including gun safes. • Every Safe is Different, so make sure to account for the size, weight, and location of the safe (before the move and where it should be after). Dov emphasizes the importance of protecting floors during residential moves, so movers need to keep in mind the location in which the safe is going and what care is necessary to prevent floor damage. • Move it with 2+ people; even if you or your movers think they can handle carrying a safe by themselves, it’s better to always have at least one helping hand. Dov notes that people commonly get stuck in the middle of moving their safe when their bodies can’t take moving around such a heavy object anymore. • Know how much it weighs: “Don’t guess. You’ll get hurt. You’ll get stuck. Safes are heavier than you expect.” Be exact and put a number to the safe’s weight. This will allow you to pick the right equipment for moving your safe and make a plan." • Have a plan: Know which way you’re going with a safe before you pick it up. Take into account doorways and spacing to ensure you have the proper clearance. Make sure there isn’t any risk of damaging walls, doors, floors, or anything else at any point in your path. • Don’t get hurt: “Technique and planning always beats brute force,” Dov tells me. You can’t simply muscle through moving a safe. “Watch out for fingers and toes... and If a safe falls, let it drop. You can’t catch it." Most safe movers will offer insurance, which can help refund you for damage incurred to a safe when it’s dropped. • Be aware of their size: Gun safes are usually bigger than regular safes, but they don’t usually weigh any more. Take into account their greater size when considering what kind of equipment you need, and what path you’ll take moving the safe. • Take extra care: “Gun safes require extra precaution because of their hi-gloss finish.” Make sure to be careful around tight spaces and in any situations where the safes may incur damage.